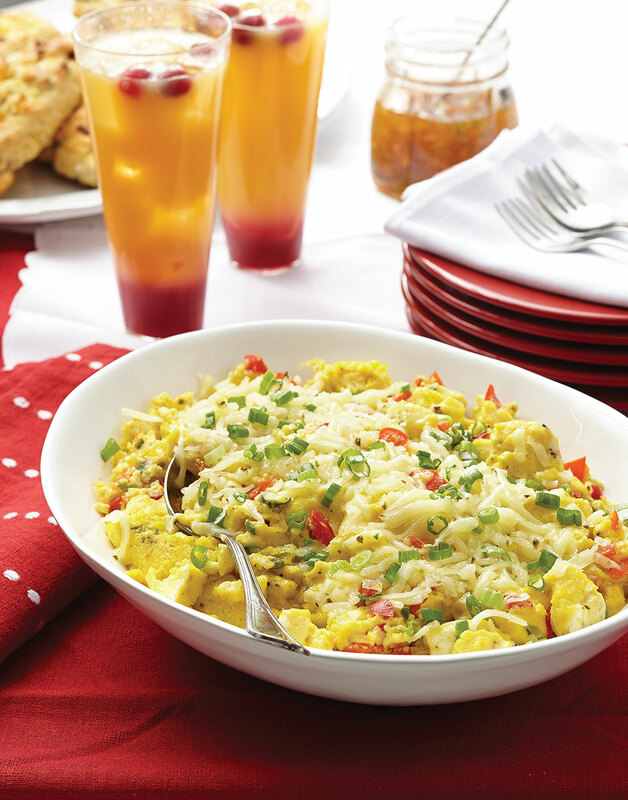 When cooking for an early morning crowd, these make-ahead cheesy, slightly spicy scrambled eggs are pure gold. All you have to do is pop this “hands-off” baked dish into the oven, brew some coffee, and you’re ready to roll — you’ll actually have time to put your feet up. After pouring combined egg-pepper-cheese mixture into the prepared baking dish, cover with plastic wrap and refrigerate overnight (be sure to uncover before baking). Coat a 9×13-inch baking dish with 2 Tbsp. melted butter. Melt remaining 2 Tbsp. butter in a nonstick skillet. Add bell pepper, scallion whites, and jalapeño to skillet; cook until softened, about 5 minutes. Let mixture cool to room temperature. Whisk together eggs, cream, salt, and black pepper. Stir in cooled bell pepper mixture, cheese, and scallion greens. Pour mixture into prepared baking dish. Bake egg mixture 10 minutes; stir and bake until eggs are set to your liking, 10–20 minutes more. Transfer eggs to serving bowl. To keep the eggs from curdling, be sure to let the pepper mixture cool before adding it to the egg mixture. Because the hot baking dish will keep cooking the eggs, transfer them to a serving bowl right away.